A conversation focused on ‘the studio’ with five Foundation Art and Design students that I work with revealed some interesting ideas about communal space, sharing ideas and getting value for money within a Higher Education setting. During the first Exploratory stage of our Foundation course the students undertake a series of workshops which change daily so it isn’t until the Pathway stage, that usually starts around the beginning of November, that studio spaces are constructed and allocated. The individual spaces are all the same size and are supplemented with the addition of flexi spaces which allow for larger scale work. I started by asking the students ‘how they feel about their studio spaces’. They talked easily about the positive benefits they felt came with having their own space, finding it easier to work, opportunities to personalise spaces with research and inspiration material and a feeling of being more comfortable when making work somewhere personal and defined. Those who had work desks at home found these were often cluttered and used for a range of activities. They found having a dedicated workspace in the studio was positive (and less cluttered) although one student did report that their studio space was also cluttered and that was a true reflection of themselves and the number of ideas they had. When asked ‘what happens in the studio space’ they shared thoughts around the process of laying out materials over a period of time, it was a creative thinking space, and that having one enable them to focus on the task in hand. The Graphic Design student in the group didn’t consider her studio space to be her workspace but rather the Mac she creates all her work on. Her studio space is used as a place for writing up annotations and reflections. When I asked about how much time they spent in their studio spaces it ranged between 20-80% of their course time within the working week. 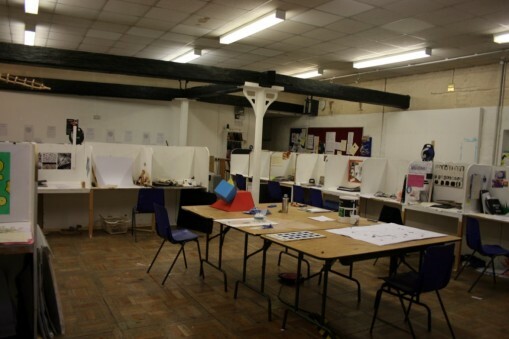 There are 30 students on the Art Foundation course with all the studio spaces housed in one room and I was interested in how this communal workspace worked for them. One student reported being most productive when the only one in the studio, as this allowed work to be laid out across the floor and the radio to be on. Other students reported that they sometimes find it distracting working with so many other people around but also that they themselves also distract other students from working. Some felt they wouldn’t want to work alone as they wouldn’t be able to see what others were doing. There were lots of comments about sharing ideas, knowledge and suggestions for artists to look up. They found being in a communal space motivating and it was nice to know there were other people around to share ideas with if needed. The studio spaces are modest in size and some reported that they did feel restricted by this at times but with flexi spaces available (access to which they tend to manage between themselves) this allows for larger scale work to be produced. I was interested in how, when attending open days for Higher Education courses they considered the studio spaces on offer. It was observed that generally the studio spaces in London where smaller than outside of the capital and that in this sample group generally they felt they would like the opportunity to have a space they could call their own. They felt it was was important to have a studio space and somewhere to store work, flexibility of access was also something they considered. The Graphic Design student said she was more focused on looking at the computer facilities than any studio spaces. The notion of students being customers isn’t any thing new but some of the group reported that they had used the size of studio spaces on offer as a way of evaluating if they would be getting value for money for the £9,000 per year fees. 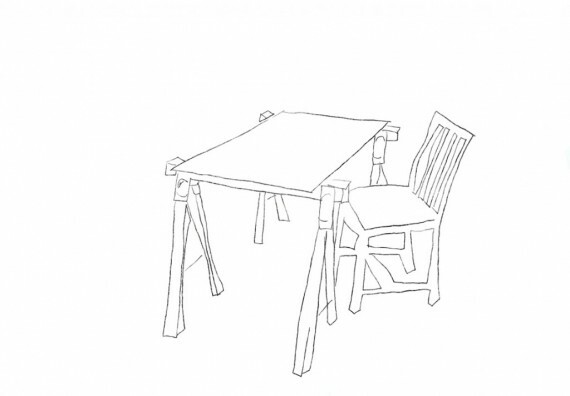 This was of course a very small sample group and I could ask another group the same questions and get a different answer but its interesting to see how how this group of 5 feel about having a defined work space. Some kind of communal work space was considered more desirable than a solitary one, there were benefits of working together and the opportunity to share ideas was important. It was also interesting to find out how significant studio spaces can be when considering applications for Undergraduate study. With thanks to Alison, Amy, Benjamin, Julia and Kate.